Rangers Int’l FC Goalkeeper, Nana suffers injury relapse – Royal Times of Nigeria. 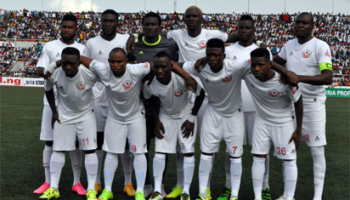 Rangers International FC of Enugu goalkeeper, Bonsu Nana, has suffered a relapse of the injury picked in a match against Lobi Stars of Makurdi in the first stanza of the league. The goalkeepers’ hope of coming back to competitive football in the next three weeks was dashed as he was placed on rest by the club today due to the relapse. 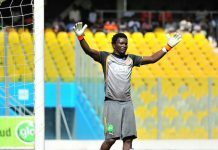 Nana had been training with the rest of the goalkeepers before the unfortunate relapse which made him miss training this morning. Speaking to newsmen in Enugu, Nana expressed disappointment over the delay saying that he never dreamt of it. Nana said that he came back from Ghana in the beginning of the second stanza of the league fully fit hoping to take back his position in the club soon. He however expressed hope that the injury will soon heal up and that he will play a part in his clubs’ quest for the continental ticket as he awaits his chance for national call up.